All press releases issued by the Registry since 1 January 1999 are available in the HUDOC database. They include summaries of the Court's judgments and decisions as well as information about pending cases and the Court’s activities in general. Press releases are available in both English and French. 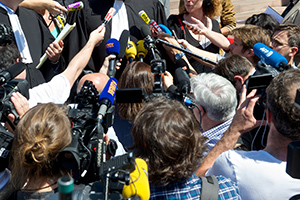 Some press releases for high-profile cases are translated into non-official languages. Press releases on Chamber judgments are generally published at 10 a.m. on Tuesdays and Thursdays. Both Chamber and Grand Chamber judgments are announced in press releases about a week in advance with a short summary of the cases concerned.Upcoming hearings are announced in a press release at the end of the preceding month. If you are looking for information on a pending case which has not yet been the subject of a press release, try searching under "Communicated cases" in the HUDOC database. Press officers are available to help journalists with specific requests and to answer their questions (languages spoken: English, French, German, Romanian and Turkish). The European Court of Human Rights would like to point out that it has no Facebook account and that any account fraudulently using the name “European Court of Human Rights” or its acronym “ECHR”, claiming to represent the Court, is a fake account. Those who have registered in advance have priority as regards seats in the hearing room, which are then allocated to others on a first-come first-served basis. If you are a journalist, please contact the Press Service to register. For more information on hearings go to the 'Hearings' web page. Photography and filming is allowed only in the public parts of the building (forecourt, entrance hall). To obtain pictures of hearings please contact the Press Service, which can provide journalists with professional-quality footage (FTP link) of the first few minutes of hearings. Webcasts of hearings can also be viewed on the same day via the Court’s website.